Looking Beyond the Temples and Beyond the Capital: Exploring the residences of the ancient Angkorians :- Thursday, March 28, 2019 at 4:00 p.m.
Each year the Cannon Beach History Center & Museum brings archaeologists, historians, authors, and scientists from all over the Pacific Northwest for their free lecture series. The series takes place each year January through June. The March presentation will focus on the latest archaeological work in Angkor, Cambodia with Professor Alison Carter. Carter has done extensive archaeological work in Cambodia and will share her discoveries with the community of Cannon Beach on Thursday, March 28 at 4:00 p.m.
Angkor, centered in the modern nation of Cambodia, was one of the largest preindustrial settlements in the world and has been the focus of more than a century of epigraphic, art historical, and architectural research. However, few scholars have examined the lives of the people who built the temples, kept the shrines running, produced the food, and managed the water. This presentation will discuss two recent excavations that examined Angkorian residential occupation. First, she will discuss excavations on a house mound within the enclosure of the state temple of Angkor Wat. 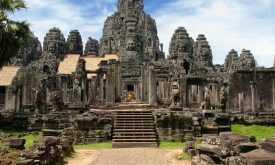 Then she will discuss their 2018 excavations on occupation mounds near the small provincial temple of Prasat Basaet, across the Tonle Sap lake from the Angkorian capital in the province of Battambang. Through this multidisciplinary research they aim to better understand the nature and timing of occupation at these sites, the types of activities taking place within an Angkorian household and compare life in the capital with life in the provinces. Alison Carter is Assistant Professor in the Department of Archaeology at the University of Oregon. She holds her degrees from the University of Wisconsion, Madison (M.S. and Ph.D.) and Oberlin College. Professor Carter is an anthropological archaeologist with interests in the political economy and evolution of complex societies in Southeast Asia, the archaeology of East and South Asia, materials analysis and LA‐ICP­‐MS (Laser Ablation Inductively Coupled Plasma Mass Spectrometry), craft technology and specialization, household archaeology, ritual and religion, trade and exchange, and bead studies.household archaeology in Angkor, Cambodia. She is also an Archaeology Institute of America featured speaker. And she lives right here in the Pacific Northwest! This event is free to the public and has been sponsored by the Ocean Lodge, Clatsop County and Martin Hospitality. Seating for Professor Carter’s presentation is very limited so please arrive a little early to get a seat, grab a cup of coffee or tea, and peruse the museum before the lecture starts at 4:00 p.m. Doors are closed at 4:15 p.m. This event has been sponsored by The Ocean Lodge, Clatsop County, and Martin North.